Is there a better alternative to Swimbi? Is Swimbi really the best app in HTML category? Will Swimbi work good on macOS 10.13.4? 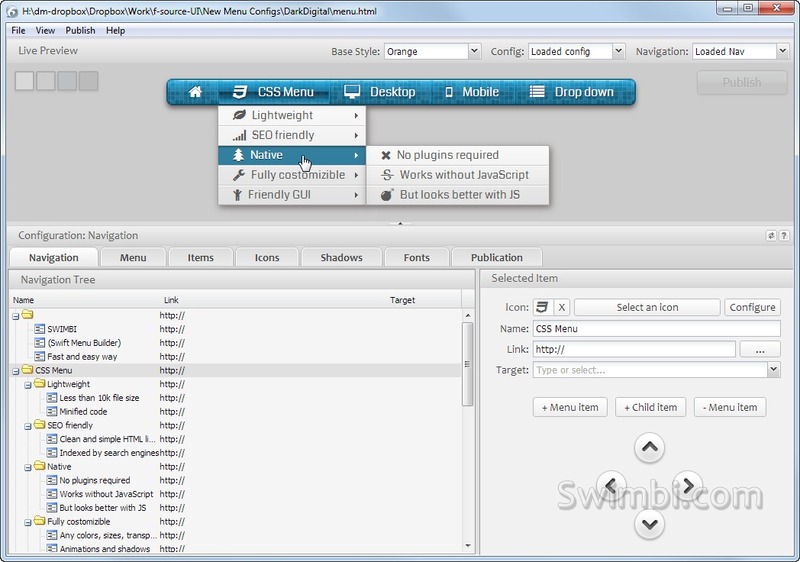 Swimbi contains only the best and popular drop down menu designs, created by professional designers. Add any of 520+ icons to make menu items more attractive. Skins and configs are are just examples. Swimbi has no limits in menu design customization. Everybody love intuitive user interfaces. If you add too much options for customization it can be helpful for experts, but confusing for anyone else. Swimbi controls are categorized by functions, separated by scope, organized in logical groups. Sitewide menu update with a single click. Fixed copy-paste in OS X.
Sitewide updates and simple template engine is a great time saver for small static websites. No more frames nor tedious copy/paste. Open a page in Swimbi, click "Publish". You got a menu on your website up and running. Use FTP connection to update your menu right on the server.